It’s Very Easy To Make A WordPress Site In GoDaddy WordPress Websites builder. WordPress is one of the world’s most popular website building applications, offering the power and flexibility to build sites exactly as you want them. WordPress has so many exciting features like the user-friendly dashboard, SEO friendly plugins availability, Media management, Simple publishing tool and many more. It is so popular that’s why you can get lots of themes and plugins both free and premiums. If you want to read the full specifications and benefits of WordPress CMS, you can read- This Article Will Give You A Clear Defined Idea On WordPress CMS. GoDaddy’s WordPress Websites, a new application that allows anyone to build a full-featured, interactive WordPress website. On WordPress with just about any feature, you can imagine. But WordPress has been a little challenging for those without technical skills and people who are new to creating a website. GoDaddy WordPress Websites make building a full-featured site with WordPress a lot easier. Below we are mentioning how GoDaddy has streamlined and simplified the WordPress website setup. 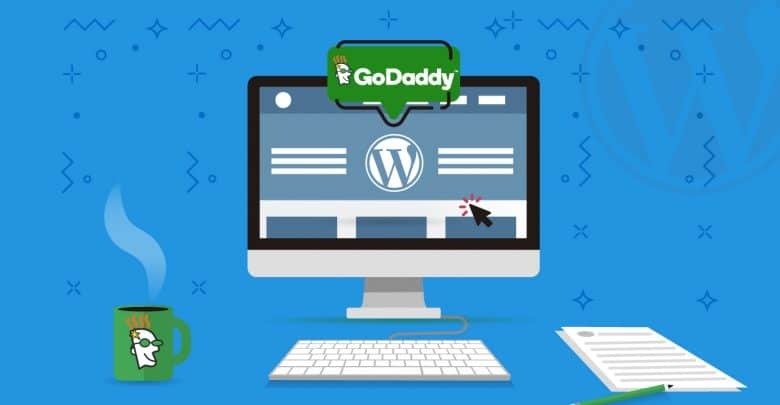 Firstly GoDaddy automatically setup your hosting and install WordPress for you. Then you need to use the Quick Start Wizard to enter information about the type of site you want and your contact information. The information you enter is used to pre-populate your website. You can also use the Wizard to link your social profiles like Facebook, Twitter, and LinkedIn to your site. Finally, you have to choose one of the professionally designed, pre-built themes that include all of the essential content and pages. That’s it! Your beautifully designed site complete with the Home page, About Us, Products & Services, Blog, Contact page and more. All you have to do is customize the placeholder content. Also included is an email signup form that collects visitor information so that you can keep in touch with your visitors using Email Marketing. When you’re ready to customize your website, click Launch the Page Builder. This visual page editor tool makes customizing your site as easy as point & click, drag & drop. Edit the text on a page and see your changes as you type. You can add images of your own, or choose from a free library of thousands of high-quality images that are included with GoDaddy WordPress Websites. You can add call-to-action buttons that will engage your visitors. More rows can be added to your site by dragging them into place and move site elements precisely where you want them. Next, come to the plugins. The real power of WordPress comes from feature plugins. To view the thousands of free WordPress plugins, you have to exit the GoDaddy WordPress Websites builder. On the WordPress Admin menu, click Plugins and Add New. Want to accept appointments online? Or maybe set up a members-only site? Basically, if you can imagine it, there’s a plugin for it. Thanks for reading. Hope you have understood how easy to make a professional-looking, full-featured WordPress site in Godaddy WordPress Websites builder. If you have any suggestion or queries, please comment below to our comment box.